Award winning fantasy author, C.A. King, was born and raised in Halton County. She currently resides in Brantford Ontario, Canada with her two sons. Caitlin isn’t a little girl anymore. The intense love of fairytales and magic she carried throughout her childhood has given way to an analytical mind and a heady crush on fellow high school senior Justin. She grew up in a highly sterilized and orderly home with parents who are nothing less than the picture of suburban sophistication. There’s just no room in Caitlin’s life for anything that cannot fit within the neat and orderly lines of logic. So when her eccentric Aunt Petunia sweeps in with a well-paying house-sitting gig and an advance copy of her latest fantasy book, things are bound to get complicated. There’s something weird about Aunt Petunia’s house, and with an unchaperoned party in the works, Caitlin’s about to get a crash course in magic. Do Not Open Until Halloween will draw you into C.A. King’s world even if you’ve never read anything by her before. Do Not Open Until Halloween’s prologue is a stroke of genius. In one fell swoop, the important lore is established and C.A. King has successfully set the stage for the magic of dreams and the rules of real life to overlap. Aunt Petunia is delightfully lost in her own world, her thoughts marching along to a tune all her own and making little sense to Caitlin. This skewed perspective makes for quite a bit of fun as the story progresses, especially once a special salt barrier is disrupted. 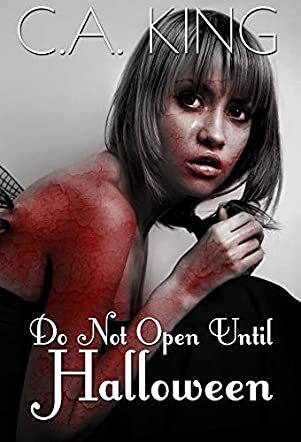 Do Not Open Until Halloween is an incredibly fast-paced romp through the absurd and the serious, taking turns that in the end left me truly surprised and kept me on my toes. It definitely bears mentioning that though the conflict is often quickly resolved and thus perhaps more suited to teenage readers, I definitely would recommend Do Not Open Until Halloween to anyone looking for a fantasy you can enjoy without diving into every nitty-gritty detail. King has crafted a fun read with references galore and all sorts of new takes on ideas that are sure to be loved.